The holidays are possibly my favorite time of year. I love all the festivities, the pretty decorations, picking out gifts for people and of course the cooking and baking! 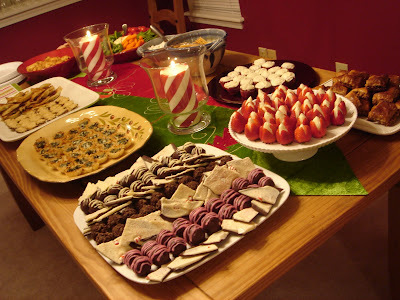 I have been hosting some form of holiday party for several years now, but it has morphed from a smaller family get together with more of a sit-down dinner to a large party with lots of friends and appetizer/dessert fare. It is always a feat of my organizational skills to pull this off while still working a full week for school but somehow I manage it by planning every detail and prepping as much as possible in advance. This year the party was definitely a success! The food was a big hit and by the end of the night it was all completely gone! That made all my hard work worth it. 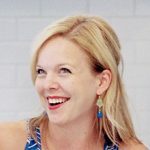 In an effort to not write the longest blog entry ever, I will simply link recipes as much as possible and add my comments or changes as well. This was my first attempt at crab Rangoon and it was awesome! This was one of the most popular things I served and many guests commented on how much they enjoyed it. I loved it and can’t wait to make it again. I have been making these stuffed mushrooms for quite some time now, and have become somewhat “known” for them among my friends. Several of the guests last year went a little crazy over these tasty bites so I knew I could not leave them off the menu this year. 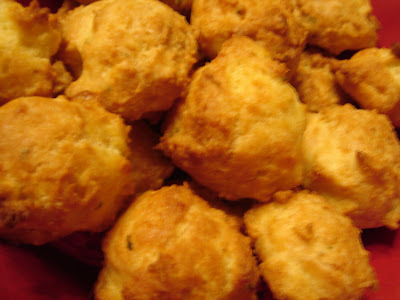 I was glad I made them again because one of my friends showed up and said, “I’ve been looking forward to these since last year!” The recipe linked below is the one I follow, with a few changes. I only make half the amount of filling per mushroom than the original recipe, otherwise you end up with a ton left over. Also, I use the food processor to chop the mushroom stems and garlic, which is a huge time saver. The blurry pic really does not do these little bites justice, but they are delicious. 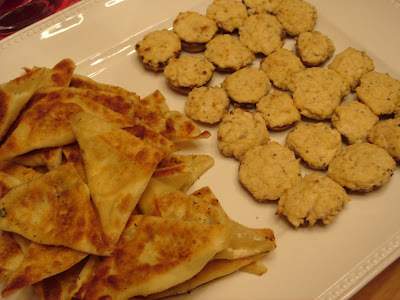 I had never made these before but was pleasantly surprised at how flavorful they were. Ben and I both thought they had a taste reminiscent of Pepperidge Farm goldfish crackers – but way better. I got this recipe from Beth’s blog and followed it almost exactly, except that I took her advice and added some herbs (thyme, parsley) for a bit more flavor. I did use Gruyere cheese for mine and the flavor was great. These savory pastry cups were easy to whip up and so very yummy. Unfortunately I don’t have an exact recipe for these, as I just threw the ingredients together. I basically mixed up chopped spinach, crumbled goat cheese, shredded mozzarella cheese, grated Parmesan cheese, minced garlic, salt and pepper to taste. 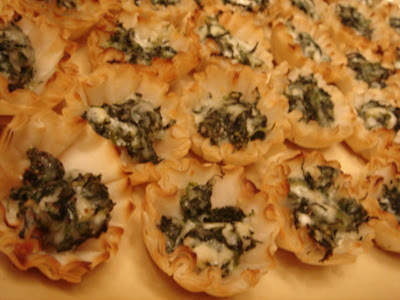 I used frozen phyllo cups, filled them with the spinach mixture and baked for maybe 10 minutes at 350°. I had tons of leftover filling and didn’t end up using it due to being out of town for the holidays, but I’m sure it would be wonderful if used to stuff chicken for dinner. These were served on a red platter which is why the pic is so dark, but they were really delicious. I used a cake recipe from ThatSweetAng and a frosting recipe from Foodie Bride. The cake recipe was a bit odd with the order and method of combining ingredients, and though it turned out well in the end, I would recommend adding ingredients in a more traditional manner (i.e. not adding the eggs and vinegar to the flour mixture but to the wet ingredients instead, etc.) 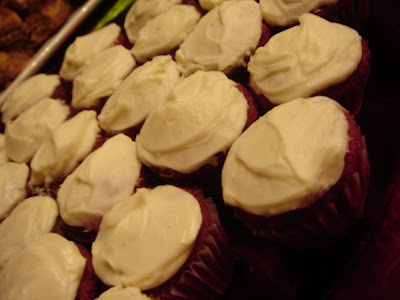 The frosting was absolutely perfect and will probably become my default recipe for cream cheese frosting from now on. To make the mini cupcakes I halved the batter recipe, filled the cups 2/3 full and baked for 14 minutes. This yielded about 35 mini cupcakes. I love these cute little things! 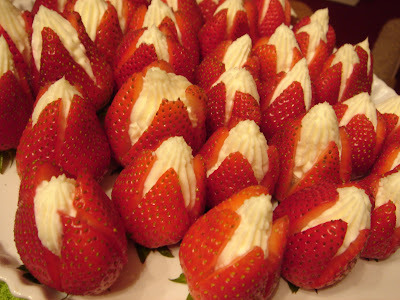 Strawberries, cream cheese and sugar – what’s not to love? These were super simple to make but impressive to look at. Plus, I got to use my mechanical pastry bag, one of my most favorite kitchen tools :) My only change from the original recipe was to leave the stems on the berries (I think they look prettier) and to cut two slices down the berry rather than just one giving them a more symmetrical appearance and making filling easier. By now I think just about everyone in the food blogging world has heard of Oreo truffles, but just in case you haven’t, give them a try. They are easy to make and a very sweet treat. I especially love homemade truffles because they are another thing that is simple to make but very impressive to guests. Unfortunately I cannot vouch for the taste of these personally since both the espresso and the alcohol (even though it is a tiny bit) stopped me from trying them. However, these were definitely Ben’s favorite of the truffles I made. He said he couldn’t taste the Bailey’s in them so next time I will probably use 3 tbsp. but other than that these were a delicious and easy truffle. I decided to use my old standby truffle recipe but mix it up a bit to create a raspberry truffle. 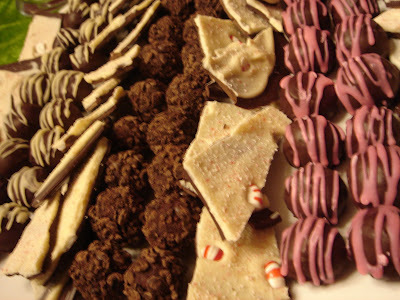 I was so thrilled with the end result and these were by far my favorite of the truffles. I omitted the bourbon and added 1.5 tsp. of raspberry extract and 2 tsp. raspberry jam to the filling. For the drizzle, I made a simple confectioners’ sugar glaze and added pink food coloring. I personally am not a huge fan of dark chocolate, but I think these would probably be even better covered in dark chocolate rather than semi-sweet. I hope everyone had a wonderful holiday and is looking forward to a very happy New Year!